I Have an Inner Victim? Me? No way! No one likes to admit it, but we all have elements of an inner victim inside us. It can creep its way into our lives in sabotaging ways. When you can recognize some of the characteristics of your inner victim, you can change it and dissolve the blocks that hold you back. Blame: a. Putting everything in the hands of someone else – even God. b. Refusing to accept responsibility for the role we play in our own drama. Add up all those statements and this doesn’t sound like a person whom any of us would want to be around. However, we all hold some of those beliefs some of the time! You CAN do something about it and dismiss the victim. Second, ask yourself what details you are willing to change. That is the biggest step in real, permanent transformation. Third, focus on the bigger picture, on themes rather than the story. Sometimes we get so caught up in extraneous details they redefine the story altogether. Use the I Need Principle, as in, “I need a job.” For example, a sour economy doesn’t mean that you can’t look for another job. But that detail derails a lot of people. That’s when we lose sight of what’s most important: of who we are and what we really need. The details don’t matter! When you redirect your focus on the main issue, it dissolves the inner victim and allows your power center, will and source of boundaries. That’s where you dissolve the victim and let your true self shine through. This entry was posted in Ascension, Blogging, Gratitude, Healing, Love, Metaphysical, Spiritual and tagged Art, Ascension, Blue, Butterflies, Culture, Joyce Jackson, Lifestyle, Metaphysical, OM Times, Spiritual, Transformation. 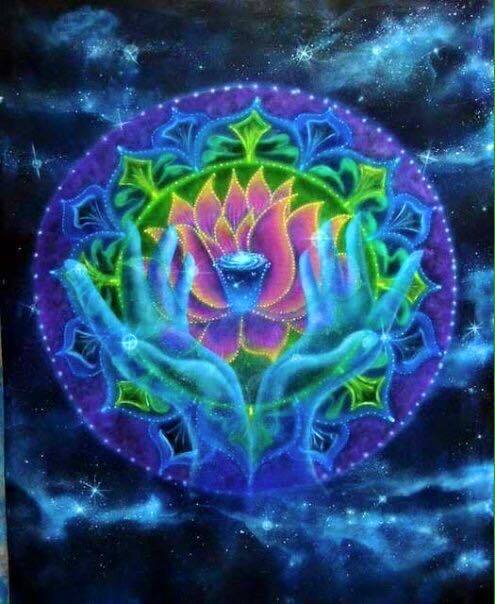 The image is the sacred water in the middle of the Lotus flower that will heal all oceans and rivers! !